home | HSR Articles | Checklist for Bases with Net Distrib . . .
One of the first things that I learned about technical analysis was that a healthy base should have more accumulation than distribution. If not, it's likely a faulty base and an unlikely candidate to lead the market. But before you write-off a stock with net distribution in its base, let me give you some background on my choice for the topic of this article. I recently started my own base archive that contains over 300 annotated bases. After going through it with a fine-toothed comb, I found that negative accumulation and distribution counts should be checked with other items before you come to a conclusion on the base. Some of the bases in my archive had more distribution than accumulation, but they all ended up having varying degrees of success. It's a plus if a base has more accumulation than distribution, but a stock that shows net distribution within its base shouldn't automatically be passed over without some further investigation. My own experience also confirms my research on negative accumulation and distribution counts. I missed several opportunities because I put too much emphasis on accumulation/distribution. This was my fault, but it motivated me to come up with a new way of evaluating bases. With that said, I have created a checklist for myself that I would like to share with you. My checklist is a collection of questions that you can run through when you see a stock with net distribution within its base. Along with your own due diligence, my checklist may help you in your base analysis. You may even have some of your own questions that can add to or improve my list. Question #1: How old is the market uptrend? Stock market uptrends will typically have several (2 or more) 10-20% corrections before becoming entrenched in a new bear market. This is important because the majority of stocks tend to follow the market's main trend. If you're in a market uptrend that's relatively young (less than 18 months old) and a stock's base shows net distribution, it might be insignificant in the big picture. This may be especially true if the stock and general market are correcting for the first time since the start of their respective uptrends. America Movil (AMX) advanced 190% off the March 2003 bottom before falling into its first base during the Spring of 2004. 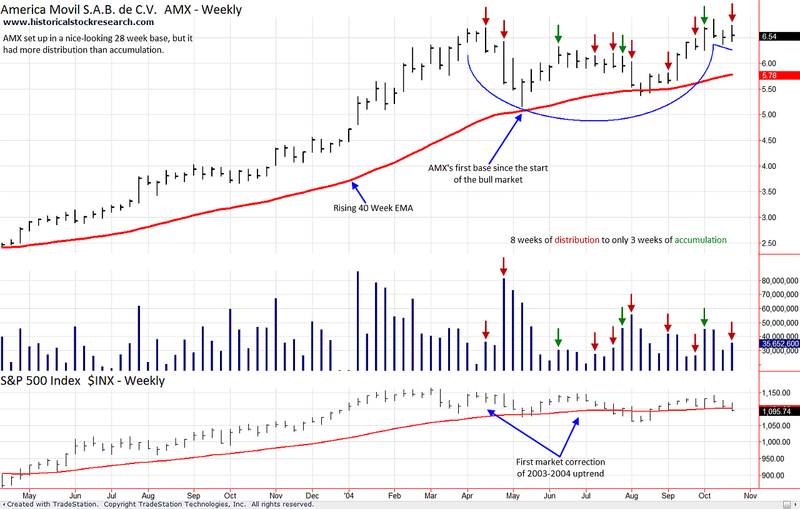 AMX declined 23% and by October 2004 was perched atop a 28-week base. 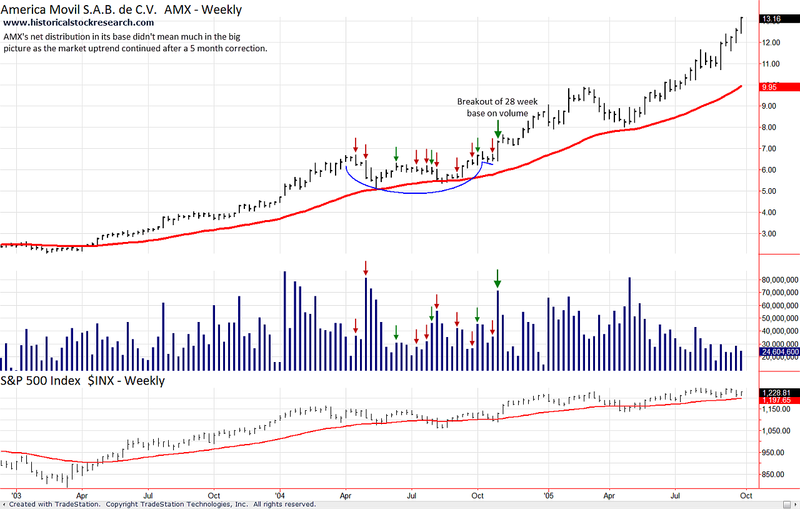 In its base, AMX had more distribution than accumulation by an 8 to 3 count. That wasn't a problem as AMX broke out in late October 2004 and shot up over 400% by 2007. In 2004, both AMX and the market were correcting for the first time since the bear market bottomed in 2002. This correction occurred within 12 months of the March 2003 low.